It's been a bad week for the creationists. First we had the news in Kansas that U. S. District Judge Daniel Crabtree has dismissed a lawsuit by Citizens for Objective Public Education that claimed that teaching evolution amounted to the endorsement of atheism, calling it "without merit." COPE objected to the Next Generation Science Standards, which are unequivocal in their support of the evolutionary model, saying that they "lead impressionable students into the religious sphere by leading them to ask ultimate questions like what is the cause and nature of life in the universe — 'where do we come from?'" This casts science teachers in the role of theologians, COPE says, even though science "has not answered these religious questions and never can." What's interesting about this is that they're partly right. Science is closing in on more and more of the big questions -- how the universe began, the origins of life on Earth, whether life might be possible on other planets orbiting other stars. But where they get this badly wrong is that these aren't religious questions. Religion answers these questions one way -- "god did it" -- and then promptly says "q.e.d." and closes the book. It makes no tests of its claims, runs no experiments, does not revise the model if new data comes to light. Science teachers aren't theologians. Far from it. Science and religion as methods are diametrically opposed to one another. If science and religion come to different answers about a question, you have to choose one or the other. There is no reconciling them, because their ways of arriving at the truth have little in common. But in a way, by teaching evolution, we are making a statement with some theological import. We're saying that science works, that it is in this case a better way of knowing the truth than religion is. But this isn't that shocking, really. Even most extremely religious folks trust science in a host of other areas. It's not like fundamentalists are asking us to jettison the periodic table in favor of revealed truth regarding the composition of matter. Evolution has become something of a last-stand battleground, where science's evidence-based answers and religion's evidence-free claims are coming to blows. Crabtree, predictably, danced around that point a little, merely claiming in his ruling that COPE had not been able to provide specific enough details of the injuries NGSS is supposed to have inflicted upon innocent children. I guess it wouldn't be politic for a federal judge to come right out and say, "Get your damn noses out of the science classroom." What I find most amusing about this is that he has somehow linked an understanding of science with being liberal, which last I checked weren't the same thing. But as a ploy, it's pretty shrewd, given that he's operating in a part of the United States where "liberals" are right up there with "baby eaters" in popularity. And as Mehta also mentioned, you can't sink this ship largely because it's on land, and we're not really friends. But Ham has never been known to allow reality to intrude on his vision, so there's no reason we should expect him to start now. In any case, these efforts strike me as desperation, and it may be that we're seeing the last gasps of this fundamentally anti-science worldview. At some point, they're bound to give up, right? One can only hope. 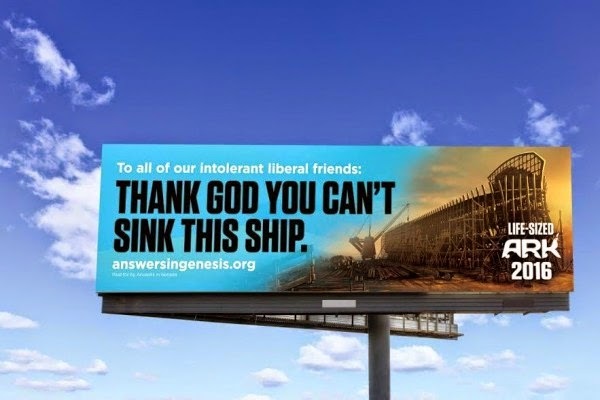 If the creationists are struggling in states like Kansas and Kentucky, it might be that as a nation we can finally move past Bronze Age mythology as a primary basis for understanding. Once the ark is all built, I'd like to organize several thousand people to break in at night carrying life-size models of two of every animal species, which we would cram into every available space, then spread out the rest on the ground around it. And put up a sign saying, "Sorry, God, they don't come even remotely close to fitting. And I haven't even been to the Americas yet. - Noah"